How can deferred service state data be scaled and kept fault-tolerant? State data deferred via State Repository or Stateful Services can be subject to performance bottlenecks and failure, especially when exposed to high-usage volumes. 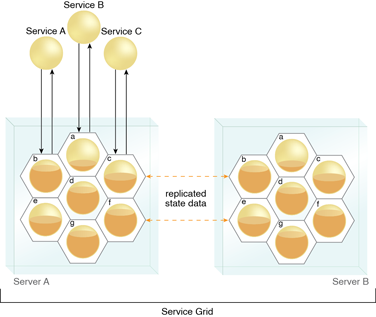 State data is deferred to a collection of stateful system services that form a grid that provides high scalability and fault tolerance through memory replication and redundancy and supporting infrastructure. Grid technology is introduced into the enterprise or inventory architecture. This pattern can require a significant infrastructure upgrade and can correspondingly increase governance burden.